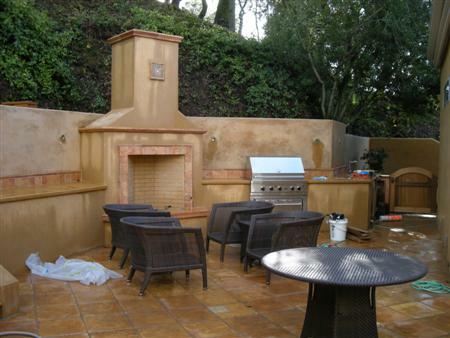 Here is a current project in Napa for an outdoor fireplace and kitchen that is in construction. The design for this project really opened up a small backyard and brought the detailing and richness that was present inside the house to the landscape for a great outdoor living space. The outdoor kitchen countertop partially completed- angle iron steel reinforces the countertop to be installed. Layout of the outdoor kitchen counters and integrated Rumford Fireplace. The color coat of stucco and finish detailing have yet to be installed. See below for the design development details for the fireplace.